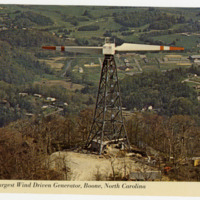 This image is of the "Horn in the West" stage and of the Blue Ridge Electric Membership Meeting. 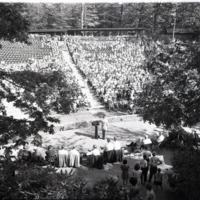 The original envelope was labeled "Blue Ridge Membership Elec Meeting, 9-4-54" and had been filed under "School Groups." 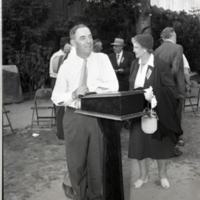 In this image, a man stands at a podium on the "Horn in the West" stage. 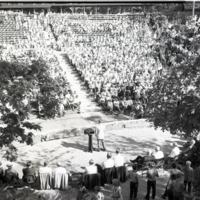 The original envelope was labeled "Blue Ridge Membership Elec Meeting, 9-4-54" and had been filed under "School Groups." 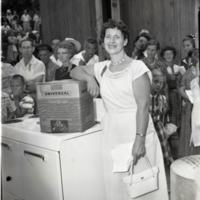 This image is of a woman posing with a kitchen stove and a kitchen mixer box. The original envelope was labeled "Blue Ridge Membership Elec Meeting, 9-4-54" and had been filed under "School Groups." 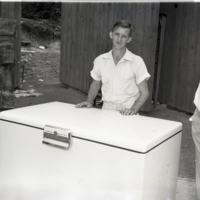 In this image, a man is posed behind a large electric appliance. 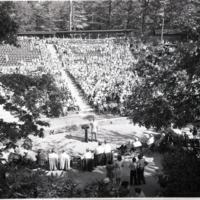 The original envelope was labeled "Blue Ridge Membership Elec Meeting, 9-4-54" and had been filed under "School Groups." 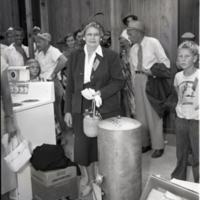 In this image, a woman wearing a dark colored suit stands near a kitchen stove. 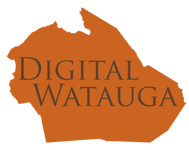 The original envelope was labeled "Blue Ridge Membership Elec Meeting, 9-4-54" and had been filed under "School Groups." 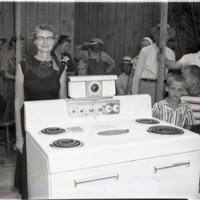 In this image, a woman stands behind a large kitchen stove. 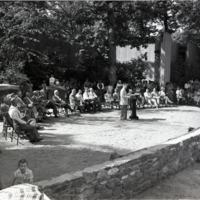 The original envelope was labeled "Blue Ridge Membership Elec Meeting, 9-4-54" and had been filed under "School Groups."